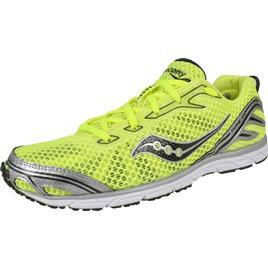 Racing flats are suitable for track and field, cross country and road racing. They differ from trainers in that they have relatively little support and little to no heel lift, as well as having a shallow tread on a long-lasting sole. With the smaller amount of support and cushioning in comparison to other running shoes, these are typically not recommended for those just starting their running training, or those who have not built up sufficient leg and/or foot strength. For more experienced runners, however, racing flats are invaluable as their lack of weight allows for much quicker running than normal trainers would. 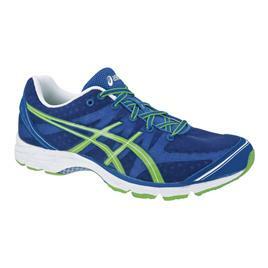 The Asics DS Gel Racer is a lightweight racing shoe with plenty of shock absorption and cushioning, and its vented sole and midsole allow for maximum breathability whilst keeping the shoe’s weight down to encourage fast running. This shoe is exceptionally lightweight and comfortable, and is a superb choice for anyone who wants to achieve fast times in any distance up to 10k – though it can even be used in marathons by fast, efficient runners.